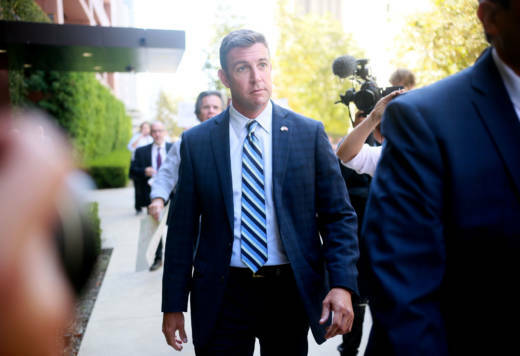 SAN DIEGO — Republican Rep. Duncan Hunter has suggested that his wife was to blame for the alleged misuse of campaign funds after the couple was indicted for using up to $250,000 for trips, clothing purchases and school tuition. 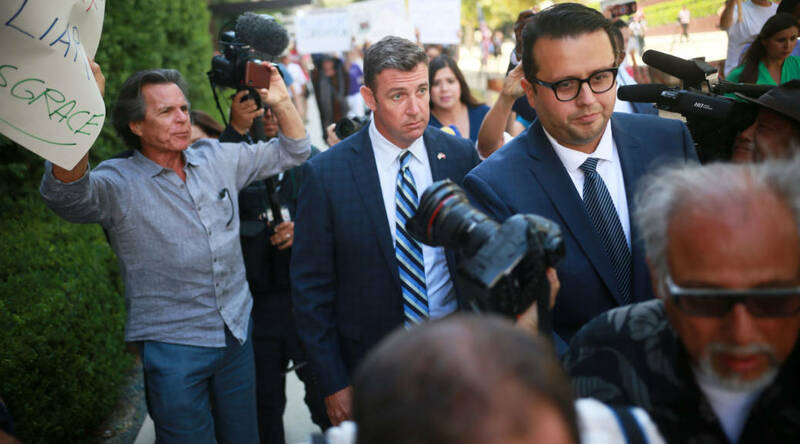 In an interview Thursday with Fox News' Martha MacCallum after the couple pleaded not guilty to illegally using the campaign account for personal expenses, the San Diego congressman said his campaign made mistakes and that his wife was his campaign manager. "So whatever she did, that will be looked at, too, I'm sure," Hunter said. "But I didn't do it. I didn't spend any money illegally, I did not use campaign money." Hunter and his wife, Margaret, entered federal court in San Diego separately with their own attorneys to enter their pleas -- and both also left separately. Margaret Hunter's lawyer, Thomas McNamara, did not immediately respond to phone and email messages Friday seeking comment. In the interview, Hunter said he gave his wife power of attorney when he deployed as a Marine to Iraq in 2003 and that she has handled his finances throughout his five terms in office. In 2017, when reports emerged that Hunter was being investigated for misuse of campaign money, he said that his campaign would stop paying his wife. A year earlier he told the San Diego Union-Tribune that he and his wife held the only campaign credit cards and that he would be the only cardholder going forward. He told Fox News that he also paid back $60,000 to his campaign and that the allegations are "pure politics" ahead of the November election. "My campaign did make mistakes," Hunter told the network. "There was money spent on things, not by me but by the campaign, and I paid that back before my last election." Hunter defended some of the spending, saying trips paid for with campaign funds were for fundraising. The federal grand jury indictment depicts the couple as binge spenders who over eight years pocketed a steady stream of dollars intended for campaign purposes, while their household budget was awash in red ink. In 2015, Hunter told his wife he wanted to buy a pair of "Hawaii shorts" but had run out of money, the indictment said. She suggested that he "buy the shorts at a golf pro shop so that they could falsely describe the purchase later as 'some (golf) balls for the wounded warriors,' " the indictment said. Hunter told Fox News that he would never do that, especially to the wounded veterans. The indictment listed alleged use of campaign money to pay for tuition for his children's private school, video games, dental work, lavish dinners and movie tickets. In April 2015, Margaret Hunter spent nearly $1,000 in campaign funds to fly her mother and her mother's boyfriend to Poland and later told the campaign treasurer they were campaign trips to New Orleans and Kentucky, according to the court documents. Hunter's office has said that one of the charges he repaid to the campaign account was a $600 fee for flying a pet bunny with his family. In a statement, House Speaker Paul Ryan called the charges "deeply serious" and said Hunter will be removed from his committee assignments, pending resolution of the case. House Democratic leader Nancy Pelosi said Ryan should call on Hunter to resign.